Ms. Hagar Ibrahim is an experienced educator who has taught Quran, Islamic Studies and Arabic for the past 9 years to adults and children. 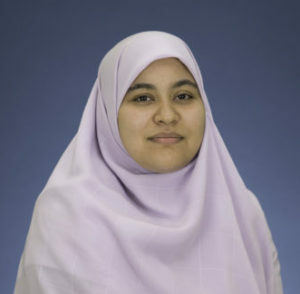 Prior to joining Tarbiyah Academy, Ms. Ibrahim worked at PGMA’s An-Nur Academy as the Head of their Quran & Islamic Studies department. Ms. Ibrahim graduated from Al-Azhar in 2005 and attended Dar Al-Alloum in Egypt where she got her bachelor’s degree in Arabic language and Islamic studies., She then continued for post graduate studies and got a pre-master degree in the Sharia Law in 2015. Ms. Ibrahim has the highest certificate (Ijaza) in Qur’anic Reading (Qira’aat) in both Hafs and Warsh. She also has Ijaza as a Quran Teacher and an Ijaza in Quran studies from Al-Azhar Al-Sharif (Institute of Qur’an Qiraa’at, Egypt). Ms. Ibrahim is eager to teach Tarbiyah students not only how to read the Qur’an with fluency, but also to become life-long learners of the Quran who can impart their knowledge to others with love and understanding. Contact Ms. Ibrahim at hibrahim@tarbiyahacademy.org.